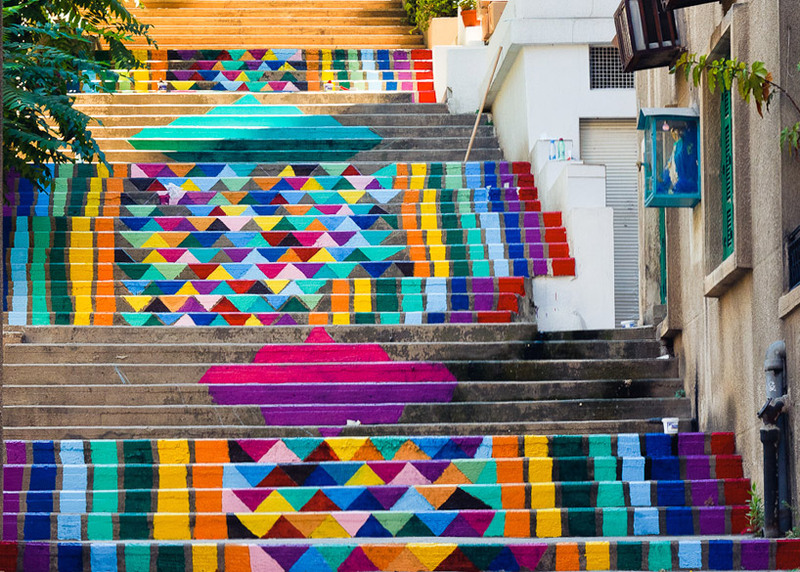 Ever since I saw the pictures pop up in arts magazines, I have wanted to see the “colorful stairs of Beirut” live. The stairs were originally painted by a collective of young artists called Dihzahyners as project called Paint Up Beirut (through the link you can see more photos of the painting process and their other projects in the city). The stairs were on my list of places I really wanted to see, but unfortunately we were a bit too late: All the paint was gone and the stairs were back to their original grey color! UPDATE: Jubran Elias, the co-founder of Dihzahyners contacted me in the comments and apparently we were by the wrong stairs! I had a hunch this might have been the case, but since Beirut doesn’t really have exact street addresses, we just went by what people thought were the correct stairs. I’m actually happy to hear it was just us who were in the wrong place and the stairs still exist, in color! So ignore all my instructions and babbling :-), the correct information about the location of the stairs is in the comments section below. Here’s a link to their facebook page for information about paint up events and colorful inspiration from all over the world. Beirut so needs more incentives like this. If they are ever doing painting when I’m there, count me in! Fresh paint (photo by Dihzahynerz via Designboom), note the Virgin Mary in the glass box on the right — a common sight in the Christian areas of Lebanon. I am not sure if I should be upset at the sun for fading the colors, or for the city for not paying them for the upkeep. This is how the stairs look like today (they are much longer than I expected, 500m, and worth seeing even without the paint — just bring back the colors please!). The stairs are called L’Escalier de L’Art, also known as L’Escalier de Saint-Nicolas. As a part of our artsy day, we also headed down to the Beirut Art Center. I first read about the center when it opened in 2009 in the New York Times, and wanted to visit ever since. Beirut has a vibrant theater, art and writers’ scene but unfortunately it seems to me as though for most Beirutis it’s a bit more underground than it deserves to be. A few years ago I was working for an arts festival here in Toronto and hosted a lovely bunch of young Arab authors, many of whom were from Beirut. Breaking social norms and questioning the status quo won’t necessarily earn you a golden hat in Lebanon although there are many who do it: Beirut is a city with strong roots in culture and art. Or perhaps it’s just the same as elsewhere in the world; people prefer to be entertained over being provoked. But art can not only provoke and entertain, it can also create beauty, and that’s why I thought the stairs were such a fabulous project: They colorful stairs were for everyone to see and enjoy, and brought visibility for the great things are being done in Beirut. It’s easy to just feel happy seeing all this color! Inside Beirut Art Center: The red metal rail surrounds an area of the main hall of the space and reflects how visitors react to borders in space: Do we stay outside like good citizens, or venture inside? Who goes inside and who chooses to watch from the outside? Beirut Art Center is a really nice space in a more industrial area of Beirut. This project too got a lot of publicity outside Lebanon, but hardly anyone I spoke about it in Lebanon knew about it! So, if you are ever in Beirut do go and support this place. They didn’t charge us anything for entry and it is a really nice space to go and experience. Just outside the center there was some nicely colored graffiti (if it says something offensive, I am sorry 🙂 I just like the colors!). Street art meets high art! And sorry about the odd layout of the text in this post: For some reason WordPress isn’t cooperating with me today! Day before the August 15th bombing we were invited to a restaurant to celebrate the Eve of St. Mary’s Day, which is one the most important Christian holidays in Lebanon. This, I learned, also serves as a sort of name day for all Marys, Maries and Marias. And Maris too. Here we are cutting the cake. I’m kind of crashing on cousin Maria’s cake — we are cutting the first piece like a married couple. The restaurant was a typical outdoor-type restaurant up on the mountain. Lebanese outings usually consists of several smaller dishes served at once, along with arak (an ouzo type anise-flavored drink) and wine, followed by different barbecued meats, and desserts (typically fruit and some pastries). St. Mary’s Day itself didn’t begin that well for me as I was again not feeling that wonderful. In fact, most of the trip I was like a walking advertisement for Pepto-Bismol — need I say more? During the day we drove up the mountain to a church we visited last time for St. Mary’s Day as well. The Greek Orthodox churches are always very beautifully decorated and unlike the Russian orthodox, they don’t have those onion-shaped domes I grew up associating with orthodox churches. After ringing the bells (yes, kids and adults can pull on ropes to ring the bells! ), we headed to a restaurant which was a beautiful open-air place up in the mountains. I even tasted something new: Frogs. They do taste and feel like chicken, not ‘froggy’ at all. Below: Whole frogs (not legs only!) top left; Lebanese Almaza beer top right; baba ganoush and local cheese bottom left; a camouflaged crazy frog (no wait, it’s me again) bottom right. The food and the view in this restaurant were amazing. Below: Some local olives and pickles top left; the view from our table (see the opposite mountain chain in the distance, across the valley) top right; the inside of the restaurant bottom left; hummous bottom right. After lunch, we went to visit my father-in-law’s beautifully renovated office. It literally blew my non-existent socks away: I was expecting to see some new furniture and a bit of new paint but the entire place was transformed! Wow! It looked incredibly good! After the office visit, we headed back up the mountain to Imad’s aunt’s house, which was where we were chomping birthday cake when we heard the sound of the explosion from Beirut. The bombing killed 20 people and injured 120, and utterly destroyed the nearby buildings, trapping many inside. Now, images such as the news photographs of the bombing are what we usually see of Lebanon; a reality that is sadly very true. Many Lebanese are surprised to hear that most people don’t know anything else about the country than the images of the shattered buildings, bloody victims and armed soldiers. The image of Lebanon still largely that of the civil war. When I write about our trip and the nice things we experienced, it sometimes feels wrong because this too is the reality of Lebanon: Beirut has areas that house extreme poverty. There are Syrian refugee women who beg on the streets along with their hardly 2-year-old children. There’s garbage. The traffic alone, combined with the heat can be almost unbearable. Yet, I didn’t take photos of any of this mostly because I think we have seen quite a lot of it. The image and the realities of Lebanon go from one extreme to the next, and somehow I just felt that putting these pictures up along with what has happening just a few kilometers away with us, shows perfectly the scarred beauty of Lebanon. Neither side is more ‘real’ than the other. Yesterday, two new bombs exploded in the Northern city of Tripoli. It’s not quite war yet, but it’s definitely not peace either. We are back in Canada! During our last few days in Lebanon, we made a trip to the Northern mountains, the village of Bcharre, the cedars, and the Valley of Saints (Qadisha ‘Holy’ Valley). Since I didn’t have internet access during that time, there’s still quite a few Lebanon posts coming! The trip back to Canada was pretty interesting to say the least: Beirut airport was such a chaos, which proved again that no matter how many hours before your flight you arrive, you’re always too late. The airport doesn’t operate under any known logic. The first security check is unusually before check-in; all luggage goes through a scan before you can even get to the check-in area. After the check-in, there are still 2-3 security checks that check absolutely nothing! It feels like it’s all for show. For example, normally in every security check I have been to they ask to see the liquids packed in the little plastic bag, laptops etc — not in Beirut! Also, there were even people taking holiday photos (!) at the security metal detector gates. The second last security check was absolutely ridiculous. I had to take the “Foreigners and Arabs” line (what happened to terms like “other nationalities”?). After standing there for what felt like forever, a woman in front of me was sent back from the desk because she hadn’t filled in a pink exit slip: A slip that no-one asked us to fill. A slip that was not handed out anywhere. A slip that was required but yet nowhere to be found! So I had to leave the line up where I had stood for ages while Imad was gesturing to me from the other side that our flight was leaving to find this mysterious pink piece of paper. It turned out, they had run out of the exit forms (?!) and a young officer, who moved in absolute slow-motion, was sent to get some more. I finally got one from a family that happened to have an extra one, while others still stood stranded waiting for this slow-motion person to return. The slip itself was a joke. Questions like “reason for leaving Lebanon?” are strange since the choices didn’t include options that made any sense. Tourism? Business? Other passengers were confused as well since there really wasn’t an option that correlated with “going back where I came from”. So, I just checked I’m going to Canada for “tourism”. The slip also asked for other things I don’t think quite make sense. For example, asking for ‘the father’s name’. In Lebanon your middle name is your father’s name; a daughter of a man named Joseph called Maria would go by Maria Joseph (and thus have a man’s name as ‘middle name’). Even the Lebanese passport has instead of ‘middle name’ a section for father’s name. It’s all clear and understandable. However outside Lebanon, in most of the world this is not the case: My middle name (Johanna) is not my father’s name and thus I think it is quite funny that the slip that is targeted at foreigners whose names most likely do not follow the Lebanese system, has this question on it. If they actually needed to track down a person, wouldn’t it make sense to just ask what the traveler’s name is in actuality rather than have this separate “father’s name” box on the form? Should I have written down my father’s name, or my actual middle name? I have no idea, but somewhere in Lebanon there’s now a pink form that has my father’s full name on it, middle names and all. Very confusing. Back in the queue, the officer at the desk seemed to interview everyone longer than ever necessary. Even little children! I too was prepared to tell him my life story but when it was my turn, all he did was look at my last name, and wished me a good trip. All this queuing for absolutely nothing! No questions about what I bought in Lebanon, or even where I am going. Our flight was scheduled to leave in fifteen minutes when we finally cleared the final check point. Eventually we made it to the plane, which of course was delayed because of the mayhem at the airport. Half the passengers were stuck in security for an extra wait, and yet our luggage didn’t make it to the plane. In Paris, we grabbed a quick bite and found out that we had been seated in the Premium Economy/Business class for the last stretch of our trip, which was a pleasant surprise. For once I didn’t have to sit with my knees bruised by the seat in front of me! Instead, we got plenty of space and overall a much nicer flight experience. Or, it would have been much nicer, if I hadn’t got sick again. Sniffle sniffle. It feels nice to be back home, although we could have easily done 4-5 more days in Lebanon. I’m hoping to publish everything travel-related by the end of the week, but until then I’m afraid you’re stuck with my Lebanon stories for a few more days! Day two, though technically today is day four or five. Last night was a casualty of the eruption of tension in the region. We were having birthday cake up in the mountains when suddenly we heard a loud explosion echoing across the city. The bomb was detonated in one of shiia Muslim neighbourhoods in Beirut, but it could be clearly heard everywhere. One day this will most likely boil over into another civil war. Very sad. On a happier note, we got to go to a great concert on Wednesday night. The face of Arab culture in the West today is dominated by religious issues and so it surprising to many just how much Arabic poetry and music talk about love and longing. We went to see Sabah Fakhry, one of the pioneers of reviving the traditional forms of Arabic singing. It was really interesting to see a live performance. Too bad most of the singing was done by Fakhry’s son (who has a great voice no doubt) which I think left people a little disappointed since they wanted to hear the man himself. The concert was held in the downtown area of Beirut which has been totally rebuilt after the war. We were both really impressed how it looks today; wide sidewalks and fancy store windows. Much of the original architecture is still there but the area was clean and nice to walk in. The downtown reconstruction process has been a huge project for the country since most of Beirut still visibly bears the wounds of the civil war and extreme poverty. The downtown, oddly enough, reminds me of what could have been if history had taken a brighter turn. If Beirut was once called Paris of the Middle East, it’s quite far from it today. However, in the downtown area you can soak in the feeling of the city’s glory days. Yesterday we packed our swimming gear and headed to the sea. After some swimming we decided to go against reason and take a walk. To say the least, walking is not the preferred form of transportation in Beirut: the traffic is absolutely crazy. One area that’s worth exploring by foot though, is the beautiful campus of the American University of Beirut. AUB is one of the best universities in the Middle East and was originally founded by American missionaries in the late 1800’s. The campus is set like a beautiful garden right by the sea and it truly feels like an oasis after all the honking and pollution of the streets. One thing that requires quite a lot of getting used to in Lebanon are guns, particularly heavily armed soldiers. They are a common sight at every street corner and entrance point, including AUB gates. It adds to a very strange feeling of separation and tension; one moment you are facing a combat rifle on a 20-something, and the next strolling in beautiful haven of free thought. I avoid taking pictures of the soldiers because I just want to steer clear from any potential trouble but I just wanted to mention them because the guns do signal, amongst other things, an environment of unrest which is not visible in the pictures. Have people gotten used to seeing guns all the time? I have no idea, but I can say we are not talking about ‘discreet’ little handguns here. It is a stark contrast to Toronto, or Finland where you can walk in and out of campus freely with no guards in sight and even live most of your life never seeing a firearm. After a long walk, we found our way to a Starbucks. Although I’m not the biggest coffee chain fan out there, it felt nice to have a cup of tea and do some people watching. Beirutis are generally quite enamoured by brands and so it’s easy to find pretty much every donut chain and store you can imagine. After two long flights, we arrived in Beirut in one piece. Sort of. Thanks to Air France and their sub-zero air conditioning I caught a mega-cold during the first flight from Toronto to Paris. I was totally fine before boarding and within three hours transformed into That Passenger No-one Wants To Sit Next To; a sneezing feverish mess. Luckily I’m feeling much better now, after a goodnight’s sleep and heavy medication! Beirut looks the same and the coffee tastes even better than I remembered! Here's the view of Beirut from my in-laws balcony with the Mediterranean Sea in the distance. We are going to Lebanon! Before travel, it always seems just about everything I could imagine to happen, will happen. Everything from swimming goggles to passports goes magically missing, the cat has an upset stomach, and I suddenly all my clothes are either too big or too small, or have holes in them. And yes, there’s a travel warning to Lebanon due to the political situation and violence that has erupted in the North and South, but we are planning to stay around Beirut this time. I’m really excited actually — this is the first time we are crossing the Atlantic together in 13 years! We are flying via Paris which is much better than going through our second option, Cairo. In my mind Cairo = lots of hassle = to be avoided if at all possible. When it comes to packing, Beirut is the one place where it’s easy to feel under-dressed. There’s plenty of bling and high heels in addition to more traditional dress. Hence I am packing with me pretty much every piece of clothing I own as an attempt to seem at least a bit fashionable! A tip for anyone traveling to Lebanon: Don’t overdo the “conservative” (long sleeves, trousers etc) like I did during my first trip, unless it’s winter of course! Depending on the area, the “Middle East = covered up” isn’t necessarily at all true in Lebanon (although it does vary region to region). For example, in Finland it’s considered good manners to cover the shoulders in church. In Lebanon, I saw so many people in church with strappy tops that the traditional Finnish grandmas would have had a heart attack. One thing that I would advice against however, is wearing things like skulls and crosses on your clothing (they seem to be very fashionable at the moment) — mostly because the cross might be viewed as a religious statement and skulls just have a negative connotation (unlike for example in Mexico). Now this is just my personal observation, and I might be wrong — it’s been a while since I have been there and it really depends on where you go in the country. In Beirut though, generally anything goes. One thing that I often hear people being told about traveling to Lebanon is to not to discuss about politics. Pretty much every travel website or book advices against it, which is hilarious since the Lebanese LOVE to talk about politics! They talk about politics during breakfast, lunch and dinner and are not afraid to disagree. This is very different to most Northern countries where the political of an individual is viewed as more private. For example, talking about politics in Finland during dinner can be viewed as somewhat rude towards those who do not share one’s views and might not want to share their thoughts. In Lebanon however, people are not afraid of disagreeing at the dinner table. Speaking about politics is not really the cultural faux pas the travel guides warn about — rather they try steer clear from the possibility that eager tourists might not realize that speaking about the ‘wrong politics’ with the ‘wrong group’ might cause some trouble. Generally, in everyday discussion with friends or family, talking about politics is not considered rude. I’m expecting the weather to be around 30 degrees, so we are definitely packing swimming gear as well. Most of the Lebanese beaches are private piers and you have to have membership or pay to get to use them. (We visited a really nice sandy beach in Saida (Sidon) in the South, but due to the political situation at the moment travel south is not considered safe).